Cacti require little water and few nutrients to grow and thrive. A standard potting soil retains too much moisture, which can cause the cactus roots to rot. Most potting soils also come with nutrients added in the form of compost or fertilizers, which can negatively impact the cactus. 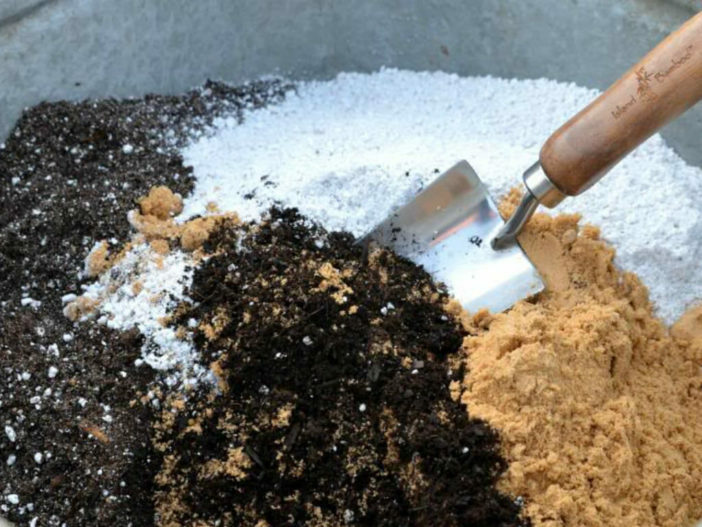 Making your own soil mixture ensures the plants receive the proper drainage necessary for healthy growth. The type of cactus soil needed depends on whether you are potting a tropical Holiday Cactus, which tolerates more moisture, or a desert cactus that needs a drier soil. Combine equal parts peat moss and ground fir bark in a bucket to create a base potting mixture for tropical or desert cacti. Alternatively, use a premade potting mixture that doesn’t contain soil. Peat moss isn’t a problem as long as you are careful of how much water you give your plants. Potting soil with peat moss, tends to retain too much water to keep cacti healthy and thriving. Mix two parts of the potting base mix with one part coarse builder’s sand for a tropical or Holiday Cactus, which requires more moisture and tolerates less drainage than desert cacti. Substitute perlite, pumice or vermiculite, if desired. Use equal parts of the base potting mix and coarse sand, perlite, pumice or vermiculite for a desert cactus, as they cannot tolerate too much moisture retention and grow better in a sandy, well-drained mixture. Mix the ingredients together until they are completely combined. Break up any large clods that form so the potting mix is evenly blended. Water the mixture in the bucket prior to filling the pots and planting the cactus. Allow the peat or coir in the mix to absorb the water for at least one hour. Use for potting when the mixture feels moist but no water droplets form if you squeeze a handful. Cactus plants have low nutrient requirements, so there is no need to add fertilizers to the potting mix. Instead, fertilize the plants sparingly with a soluble cactus fertilizer every three to four months. Over-watering can quickly kill a cactus. Place the soil only in pots that contain drainage holes to allow excess moisture to drip from the pot. Water most cactus varieties only when the soil has almost completely dried.